2 The lure to own land is hard to ignore. When Canada opened up her West, she invited settlers to come. Come they did from Europe and Asia. They all hoped to get a piece of the world to call their own. 3 After the Northwest Rebellion was put down in 1885, people began to flood into Canada. Ships were subsidized by the government to bring the people to Canada. 4 People from all over Europe went to these boats. Most people could not afford private cabins on the ships. Instead they traveled in steerage. There they were crammed with many others until the ship docked. 5 Once the ship docked, they went to immigration. From there they went to trains. The trains carried the people hundreds of miles. They rode until they reached the stations closest to their new land. 6 People came from Britain and the United States. They also came from Russia, Germany, Hungary, and Poland. Others came from Iceland, Norway, and Sweden. Many people came from China as well. 7 Many of the people who came were not farmers. They knew little about farming but were ready to learn. They wanted to own land. They wanted to make a new start in life. 8 Every ten miles the railway had sidings where small towns grew up. 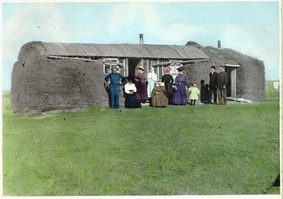 Most of the settlers were met at the towns by the Northwest Mounted Police. They were there to help the settlers get ready to go to their land.